From time to time, Acctivate Support may encounter an issue that cannot be replicated in the Demo company, and may require a copy of the database with the issue for testing. This article shows how to create that backup and send it to Acctivate Support for testing. The first step is to create a backup set of your database. It’s usually best to give this backup set a unique name so that it can be easily distinguished from other backup sets. Click File > Backup Company to open the Backup Company Data window. 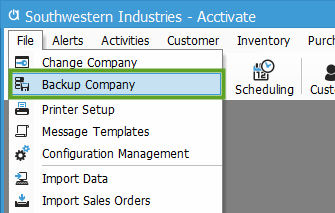 Once the Backup Company Data window is open, change the name of the Backup File to make it unique. For the Demo company, notice that the file name is changed to ‘ACCTivate$DemoTESTING.bkf’ with the ‘TESTING’ added after the company name (Demo). Also, take note of the Backup Path. This is the path that shows where the backup file is saved, you will need this to collect the backup file. Once you’ve set the file name and have taken note of the Backup Path, click Start Backup. Open File Explorer and enter the Backup Path from the backup window to find your backup file. For larger database files, we recommend compressing the file before uploading. This example shows how to do this using 7-Zip, which can be downloaded here. WinZip and WinRAR are some other examples of compression softwares that can be used to zip up/compress the backup file. Once you’ve found and prepared the file it’s time to upload. From any browser, enter https://help.acctivate.com/upload/ in the URL, or click this link. From here, either drag the backup file into the “Drag files here” window, or click Add Files to browse to the file, then click Start Upload. When the upload is finished, the Status will show 100%. Once the status shows 100% uploaded, send your Acctivate Support rep an email to let them know that the file has finished uploading.